Elaine Armstrong joined the Wayne's Word staff in 1996, although she has been making illustrations for Mr. Wolffia for more than two decades as a graphic artist at Palomar College. She has received a number of awards and certificates in graphic arts, and has developed special expertise and skills in the use of Adobe Photoshop® and Adobe Illustrator®. In addition to making numerous original illustrations for WAYNE'S WORD (see list of her work), Elaine has also made some excellent manipulations of Mr. Wolffia's color photographs, such as his infamous color photograph of a coconut crab. Elaine also designed the hippo logo that appears on the WAYNE'S WORD mast head and on the official WAYNE'S WORD T-shirts. Elaine gets along well with the hippo staff, and her computer graphic skills are invaluable to the readability and continued success of WAYNE'S WORD. Elaine in a kendo kata demonstration with Ted Mason. Elaine began her study of kendo in 1985. This ancient art of swordsmanship is one of the oldest martial arts in Japan. Kendo is derived from the words "KEN" (meaning sword) and "DO" (meaning a way or path to follow in life), and translates loosely as "the way of the sword." It evolved over the centuries from skilled, highly disciplined swordsmen known as the samurai. Modern kendo involves the use of a bamboo sword called a shinai. The shinai is used to strike the opponent on a limited number of strategic targets. Contestants wear protective armor consisting of the "men" to cover the face, head and shoulders, the "do" to cover the thorax, and the "kote" to protect hands and forearms. 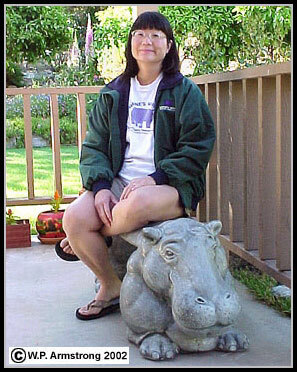 Elaine sitting on the official Wayne's Word hippo bench. Elaine currently holds the title of third degree black belt (san-dan) in kendo. She did her training at the Costa Mesa Dojo with Takeshi Yamaguchi, the San Diego County Dojo in Carlsbad with Ted Mason, and the San Diego Kendo Bu in National City with John Yamamoto and Kikuo Uyeji. Sarah modeling the official WAYNE'S WORD T-shirt, standard uniform for the entire hippo staff at the WAYNE'S WORD headquarters. These shirts have become quite popular and are in great demand by computer nerds, naturalists, college students, teachers, hippo shepherds, and unemployed biologists.